Legal separation provides married couples with an alternative to divorce. Some are not ready to give up on the marriage or are opposed to divorce, because of moral, religious or financial reasons. Maryland law does not provide for legal separation. In Maryland, couples file for a “limited divorce,” which provides them with the same legal rights and protections as a legal separation. With a “limited divorce,” couples are still legally married, but petition the court for decisions regarding property settlements, alimony, child support and custody. To file for a limited divorce in Maryland, you must be a resident of the state at the time of filing. If the grounds for the divorce occurred in another state, Maryland requires a residency period of at least one year before filing. Download the limited divorce forms from the Maryland Judiciary website or a third-party online form provider. Necessary forms include the Complaint for Limited Divorce and the Civil-Domestic Case Information Report. If spousal and child support issues are involved, you will also need the financial statement and a child support worksheet form. Complete the Civil-Domestic Case Information Report form. Fill in the name and contact information for you and your spouse. Leave the case number blank. The court clerk will fill in this information when you file the form. Complete the special requirements, alternative dispute and contested issues sections. Select the limited divorce box and input any relevant non-custody and custody issues, including any allegations for abuse. Sign and date the form. Fill out the Complaint for Limited Divorce form. Information needed includes contact, martial, residential and financial information. Input the names and dates of birth for any children. Select the grounds for the limited divorce. In Maryland, grounds for limited divorce are cruelty/excessively vicious conduct, actual desertion, constructive desertion and voluntary separation. If you have children, indicate the type of custody or visitation you want. If you are requesting alimony, state why. If you want the court to make a decision about your property, check off the kinds of property you and your spouse own together. Attach a property settlement agreement if you have one. Complete the affirmation at the bottom of the page, then sign and date the complaint. Complete the Financial Statement, if necessary such as when alimony and child custody are issues. Fill out the monthly expense list, financial statement and assets and liabilities statement sections. Monthly expenses include residence costs, food, medical and dental, transportation, recreation and entertainment, clothing and gifts. Assets cover both personal and physical community property. Liabilities range from mortgages to credit card balances. Sign and date the statement. Complete the relevant Child Support Guidelines Worksheet form, if necessary. Use Worksheet A if you are requesting primary physical custody and Worksheet B in cases of joint custody. Fill in information related to parental income, time spent with each parent and expenses related to daycare, health insurance and other child medical costs. Sign and date the worksheet. Make two copies of the forms and any attachments. Keep one copy for your files. File the original forms and pay the fee in the clerk’s office at the appropriate county circuit court. Limited divorce forms must be filed in the Maryland county where either spouse lives or works. The clerk will give you a case number and issue a Writ of Summons. Arrange for a private process server, the sheriff’s office or an adult over the age of 18 to deliver a copy of the Writ and limited divorce forms to your spouse, either in person or by certified mail. Maryland law prohibits the petitioner from serving the papers. Pay any necessary service fees. If using a private company or adult, provide him with the appropriate Affidavit of Service form and an additional copy of the Writ of Summons. He will need to file the Writ and a completed form with the court clerk, when service is complete. The sheriff’s office will automatically notify the clerk; no form is needed. Receiving notice that your spouse filed for divorce can be a stressful experience. Most states require that the filing spouse have the other spouse personally served with the divorce paperwork, which typically includes both a summons and complaint. These documents provide a basic outline of the case and explain your initial responsibilities. Knowing how and when you must respond to this paperwork will help ensure your full participation in all aspects of the divorce process. In an uncontested divorce, both spouses agree about all the terms of the divorce, such as division of property, child custody and support payments. Filing an uncontested divorce in Texas tends to be easier and faster than a contested divorce, which usually requires a trial in front of a judge. 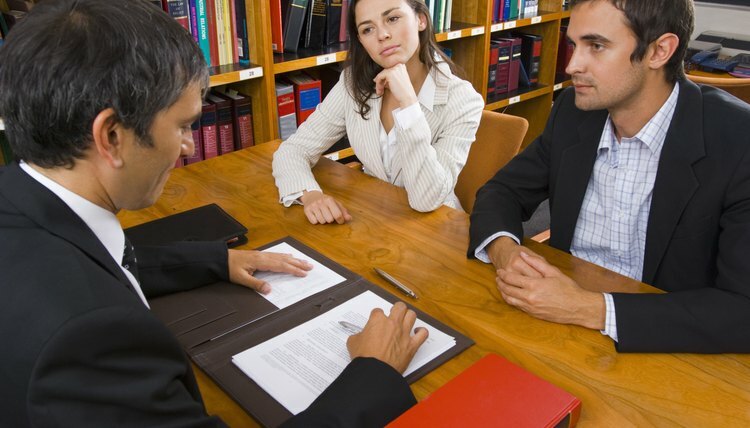 Because no trial is required, an uncontested divorce can be accomplished without an attorney. In Texas, the procedure for filing an uncontested divorce, especially where no minor children are involved, is straightforward. When your marriage is over but divorce is impossible or undesirable, a legal separation may be a viable option. In Oregon, you need only establish irreconcilable differences to qualify for legal separation; you need not explain why you're choosing not to divorce. Couples often elect legal separation if they have religious or personal objections to a divorce, receive essential medical insurance that would end with a divorce, or have not lived in Oregon for the six months required to file for divorce. A court order for legal separation divides assets and establishes child support and custody orders, just like a judgment of divorce.